Drive Culture I read about ‘torque’ a lot. What does it mean? I read about ‘torque’ a lot. What does it mean? 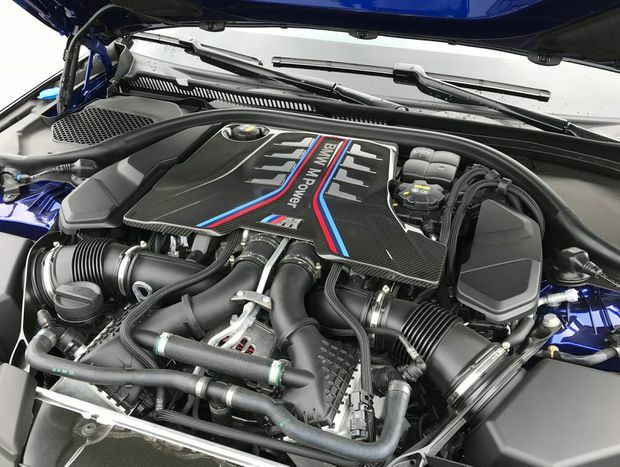 The 2018 BMW M5 boasts 600 horsepower and 553 lb-ft of peak torque. For far longer before Ricardo Montalban purred about the softness of Corinthian leather, car companies have used phoney buzzwords. But torque isn’t one of them. Both measure an engine’s output. Torque measures an engine’s turning force and horsepower measures its power. Torque is a force applied over a distance. It’s measured in pound-feet (or in metric, newton metres). For instance, think about trying to get the lug nuts off a wheel to change a flat. If you have to apply 10 pounds of force to push down on a wrench that’s a foot long in order to loosen them, that’s 10 lb-ft of torque (and those lug nuts should have been tighter). So what’s turning on your car? The engine’s crankshaft and, ultimately, the wheels. And what’s the power? Power is the amount of force over a specific amount of time. It’s a measure of how much work your engine can do. To calculate it, you multiply torque by engine speed. And to get the horsepower, a measurement invented by James Watt to sell steam engines by showing how many horses they could replace, that’s then divided by 5252 – for math reasons. The torque produced by the engine changes by the time it gets to the wheels. Some is lost along the way. But mainly, it gets magnified by the transmission, the same way a longer wrench lets you produce more torque on that lug nut. “Different vehicles will have different gear ratios and different gear-shifting control strategies, which will affect how much torque reaches the wheels during an acceleration,” Jennifer Bauman, an assistant professor at McMaster University’s faculty of engineering, said in an e-mail. So which number – torque or horsepower – matters on the road? Good question – and one that’s often debated. There are plenty of analogies on how to understand the two. A common one is: “Horsepower is how fast you hit the wall, torque is how far you take the wall with you.” Technically, that’s wrong. “Horsepower is a good measure of how fast you hit the wall, but torque is more like how much horsepower you have per turn of the crankshaft just before you hit the wall,” writes Sean Murray at Motorhub. Car makers typically give you numbers for peak torque and peak horsepower – but they’re delivered at a specific engine speed. For example, BMW’s M5 performance sedan delivers 600 hp between 5,700-6,600 r.p.m. and 553 lb-ft of peak torque from 1,800-5,700 r.p.m. Electric motors deliver their peak torque at 0 r.p.m. So what numbers should you be looking for? If you’re just looking at a light compact sedan, you may not need a lot of torque, Karwel said. “If a four-cylinder gas engine can produce 150 lb-ft of torque and 170 hp – it doesn’t need a lot of twisting force to get going, so it can deliver that torque at a very quick rate,” Karwel said. And, ultimately, because the transmission plays such a big part, those peak torque and horsepower numbers might not tell you a lot on their own, Bauman said. Have a driving question? Send it to globedrive@globeandmail.com. Canada’s a big place, so let us know where you are so we can find the answer for your city and province. Sign up for the weekly Drive newsletter, delivered to your inbox for free. Follow us on Instagram, @globedrive. Is premium gasoline worth the price difference? Why do my car insurance rates spike based on where I live?